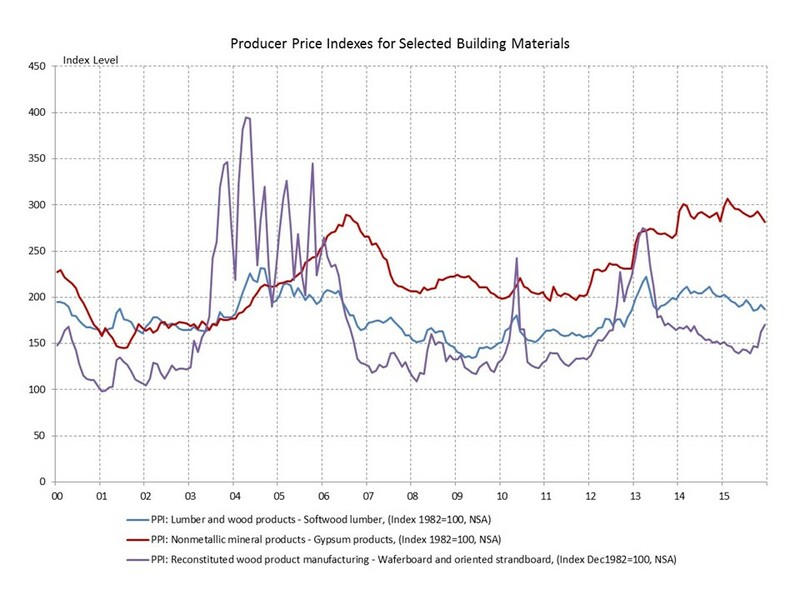 The Bureau of Labor Statistics (BLS) released the Producer Price Indexes (PPI) for December. Inflation in prices received by producers (prior to sales to consumers) declined 0.2% in December based on declining energy prices. Prices for goods declined 0.7%, but excluding food and energy, rose 0.1%. Prices for services rose 0.1%. Softwood lumber prices moved lower in December. Prices have trended down since mid-2014. Expiration of the US-Canadian Softwood Lumber Agreement (SLA) in October can be expected to keep supply in line with increasing demand from the ongoing housing recovery. We expect no sharp movement in prices and a continuation of the modest downward trend in the coming year. OSB prices rose in December adding to gains since mid-2015. A rebalancing of supply, demand and productive capacity is expected to keep prices in the current range going forward. Gypsum prices continued to slide in December from sharp increases in January and February, following the pattern that prevailed in the prior two years. Previously announced price increases from major gypsum producers (gypsum) are distributed more evenly through the year making the outlook for gypsum prices uncertain.